The Dotty Nautical wedding invitation isn’t just for people who are getting married at sea, but you can see why this would be the ideal wedding invitation for people who are looking to celebrate their happy occasion by or close to the water. The anchor is the prevalent image of the invitation, giving a purpose to the rest of the card. The font is clear and well-chosen, making it easy for people to pick out information, while tying in with the overall theme of the invitation. The dotty name in the title is derived from the fact that the background of the card is littered with gold dots, adding a light touch of class to the card. The card would have been nice with a plain background but this just makes it all seem a touch more exciting and interesting, which is definitely something that many couples are looking for. If you fear that your big day may be a bit too traditional for your tastes, adding some nice flourishes will certainly remove that concern. The blues and the golds of the invitation give this invitation a touch of class and elegance, while still offering a touch of fun. This style of invitation sits neatly between the traditional and the contemporary, perfect for couples who are not entirely surely of what sort of wedding day that they want. 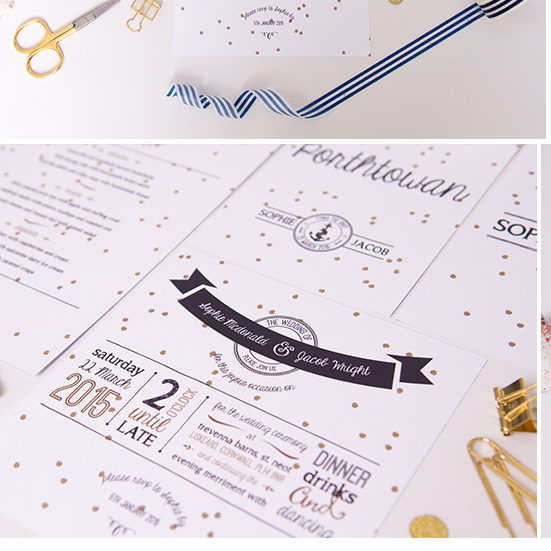 There is no need to be one thing or the other, it is possible to mix and match, styles, creating a perfect theme for the happy occasion, and this is exactly what is on offer from the Dotty Nautical wedding invitation from Anon Design. With information cards, place names order of service cards and even RSVP options available in the same style, there is a chance for couples to go absolutely dotty with everything they do in the run-up to the big event. Tags: Anchor, Nautical, Navy, Polka Dot, Seaside.